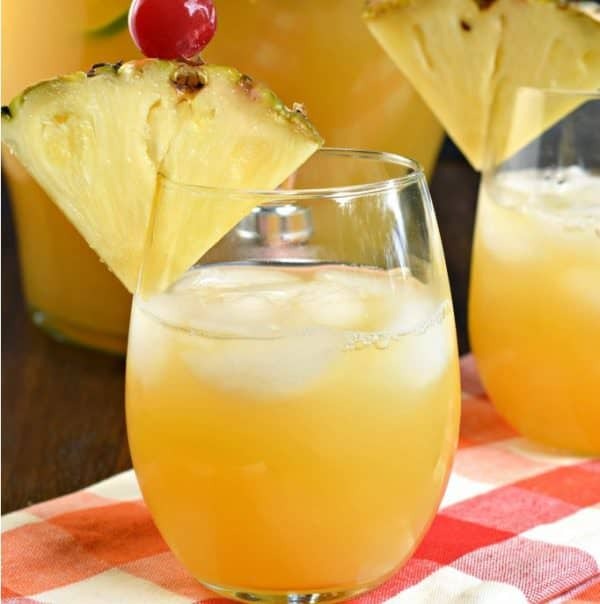 Pineapple Sangria is the perfect, refreshing summer drink! Packed with fruit, juice, and alcohol, you should whip up a batch today! Last weekend we hosted my daughter’s graduation party. It’s hard to believe she is old enough to leave for college this fall! I found a few cute ideas on the internet to make her party a blast! My youngest daughter is quite crafty and did all the creating to make this party a success! Starting with this adorable wreath featuring a back to school picture from k-12! 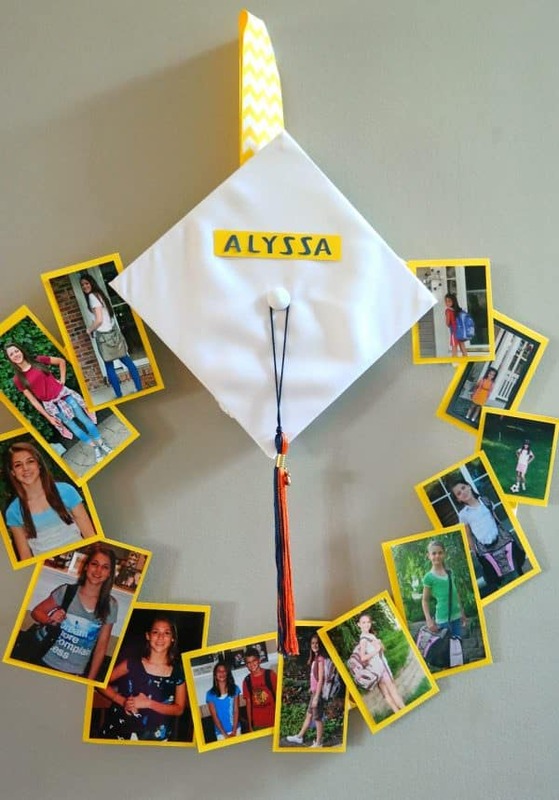 She also used my daughter’s cap and tassel on the wreath! She hot glued all everything to an 18″ wire flower wreath (like this one), that she wrapped in yellow ribbon! We also had a photo booth, which we used our Fuji Instax camera’s, some fun photo booth props, and we strung all the photos up with twine and clothespins! Such a fun way to remember the day, and have pictures of everyone who came! 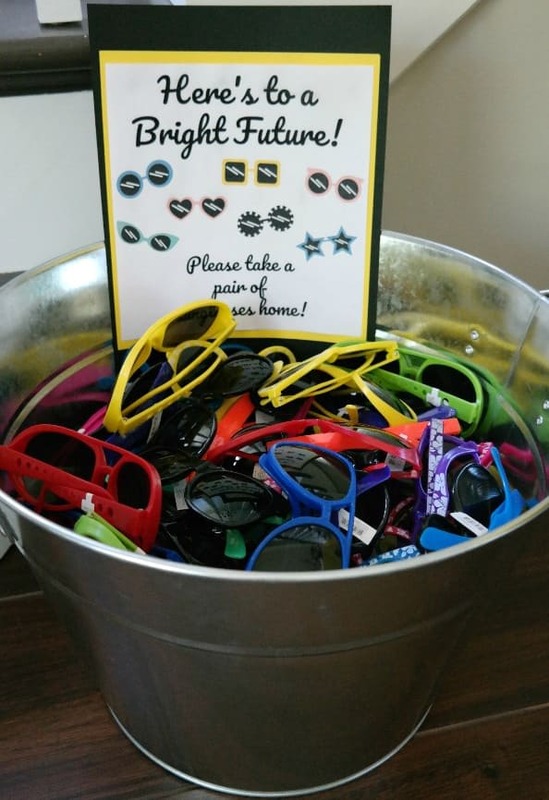 We also had a bucket of cheap sunglasses (we ordered those from Oriental Trading Co) with a sign that said “Here’s to a Bright Future.” All the guests were encouraged to take a pair of glasses home with them! As someone who does a lot of canning, we have no shortage of mason jars. 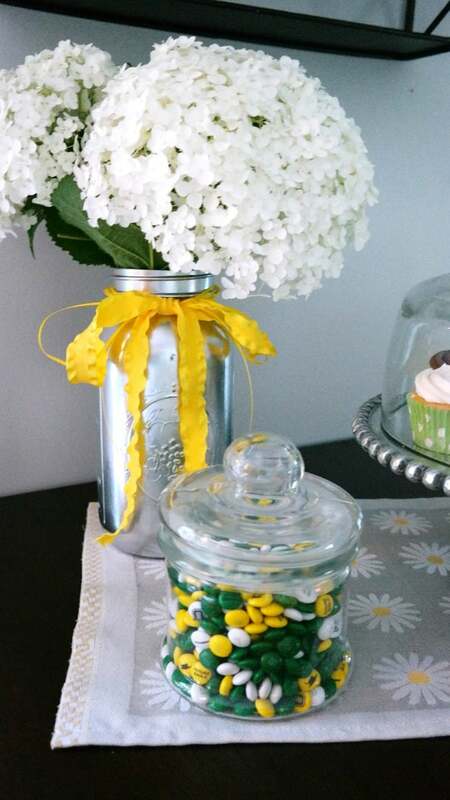 My daughter spray painted them silver, tied some yellow ribbon around them, and then we cut Hydrangea’s from our garden to go inside each vase. These jars were a great way to keep the price down but still add beauty to the tables. However, the most fun part of the celebration had to be the sweet table! 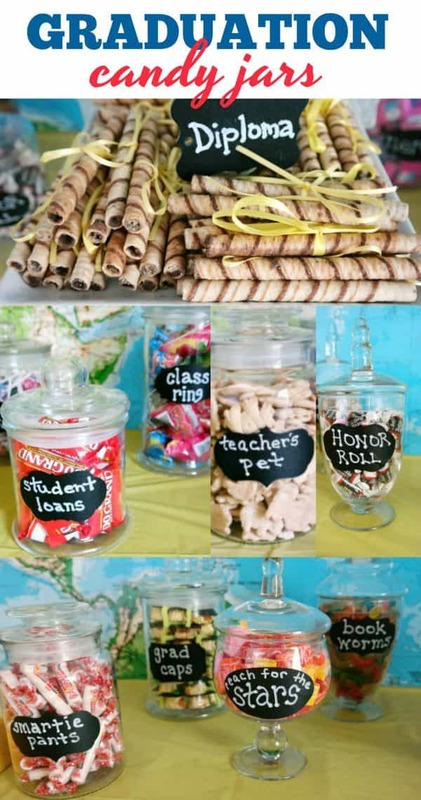 Featuring so many fun candies all around a graduation theme! From Book Worms to Diplomas, we had all the sweets covered. Grad Caps – Reese’s PB cup minis with a piece of black construction paper, a mini M&M, and a pipe cleaner! 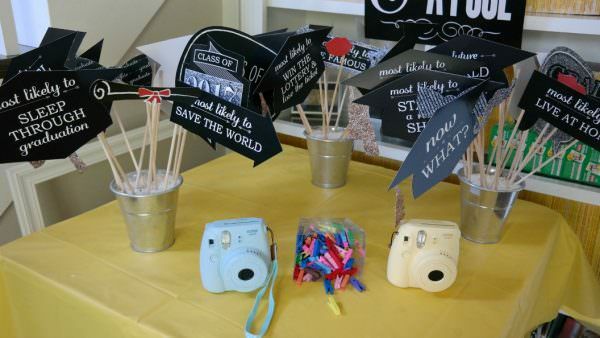 Hopefully if you’re planning a grad party, some of these tips are helpful! 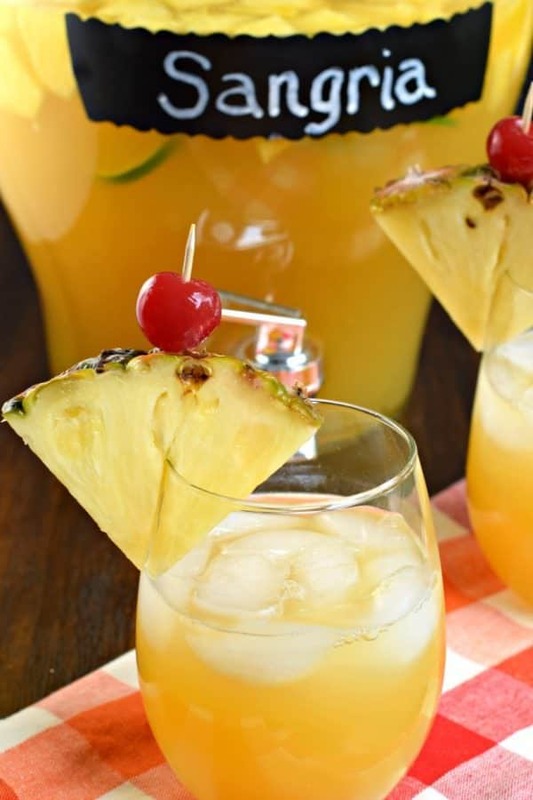 But, let’s circle back to today’s Pineapple Sangria recipe. If you look at my drink recipes, you’ll see I don’t have a whole lot of choices. 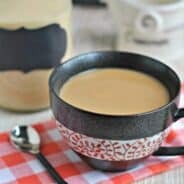 Some smoothies, lots of homemade coffee creamer recipes, a few hot drinks and a couple of alcoholic beverages! I have some good friends who make an amazing Sangria, and hopefully one day I can convince them to let me share the recipe. 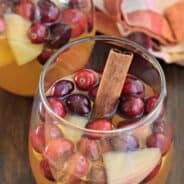 Until then, you’ll have to enjoy this Apple Cider Sangria or today’s Pineapple Sangria! I prefer to make sangria the day before. Letting the flavors mingle and giving the fruit time to soak up the alcohol makes this drink even more fantastic. But it’s not totally necessary, so if you’re short on time, don’t sweat it! Use whatever kind of white wine you prefer! I tend to use a cheap white wine in here since there are so many other flavors, you won’t notice if your wine has a “deep flavor” or is “too sweet.” I went with Pinot Grigio. Save some of your fruit for garnishing when you serve the drink! Nothing makes you think you are on vacation more than a slice of pineapple and a maraschino cherry on the side of your glass. Well, unless you have those cute little umbrellas…pop one of those in too! In a large drink container, combine sliced fruit with liquids. Stir and refrigerate until ready to serve! I find this best when made the night before! 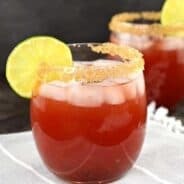 Looking for more fun summer drink recipes? 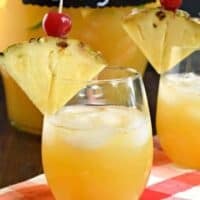 I’m totally craving this Island Breeze Cocktail from Crazy for Crust! She has me wishing I’m on a tropical vacation somewhere! Holly from Spend with Pennies made these Easy Strawberry Margaritas! I need a whole pitcher, immediately! Finally, this kid friendly Blue Pina Colada Party Punch from Wishes and Dishes looks quite refreshing. I may just have to toss in a little rum though for myself! This is calling out my name! Love it! 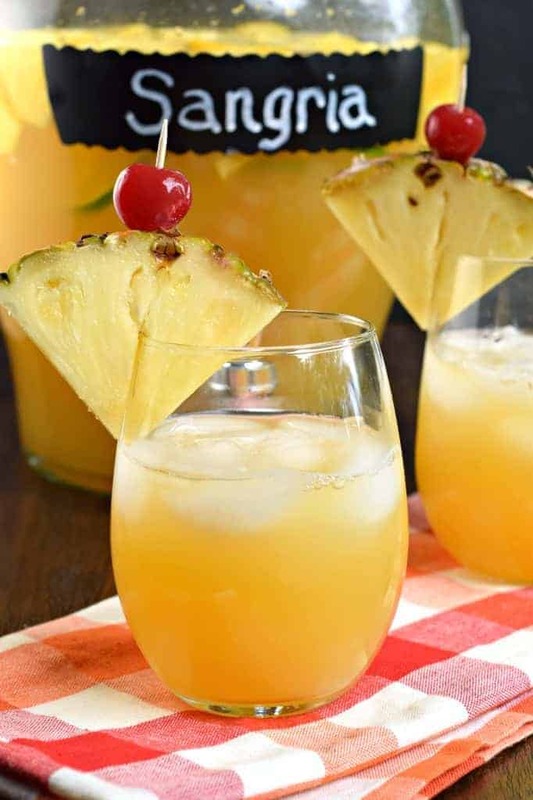 I tried your recipe with one substitution… I don’t like brandy so I used pineapple rum and it turned out awesome!! !